2015 is going to be a big year for me. I'm going to hit a lot of milestones, and I'm also going to be celebrating some with the boyfriend, Darell, as well. There is a lot that I want to accomplish this year, and everything that I do this year will set the tone for next year (I also have some huge goals for 2016 as well. I know, I'm thinking waay ahead). I know that everyone talks about resolutions for the new year, but I don't like using that word because I feel like there is a more likely chance not to accomplish your goal if you use that term. Because let's be real: how many people actually finish their New Year's Resolutions from the beginning of the year to the end? Okay, so one of the main things I'm excited for is graduating college. As of right now, I'm set to graduate this December, and even though that's not until the end of the year, it's a pretty great thing to look forward to. And I also want to take this blog to the next level too. I'll be going on 2 years with the blog this year, and I want to really propel it into what I envision it to becoming. I'm declaring 2015 as the year of making things happen, and I hope that you will declare that for your life this year as well. Here's to a new year! What are your goals for this year? What are you going to do differently? Gurrrrl, those goals though! Fabulous! You go for it! I am suuuuper excited for 2015 as this year will bring about so much change (i'm graduating from high school and moving an ocean away for university) and so many opportunities. I just need to remember to keep God first, and the rest will fall into place. You have so many great goals! I'm really trying to just follow through better this year and deal with my health issues. Good luck, buddy! Your year sounds so exciting! Good luck with your goals! 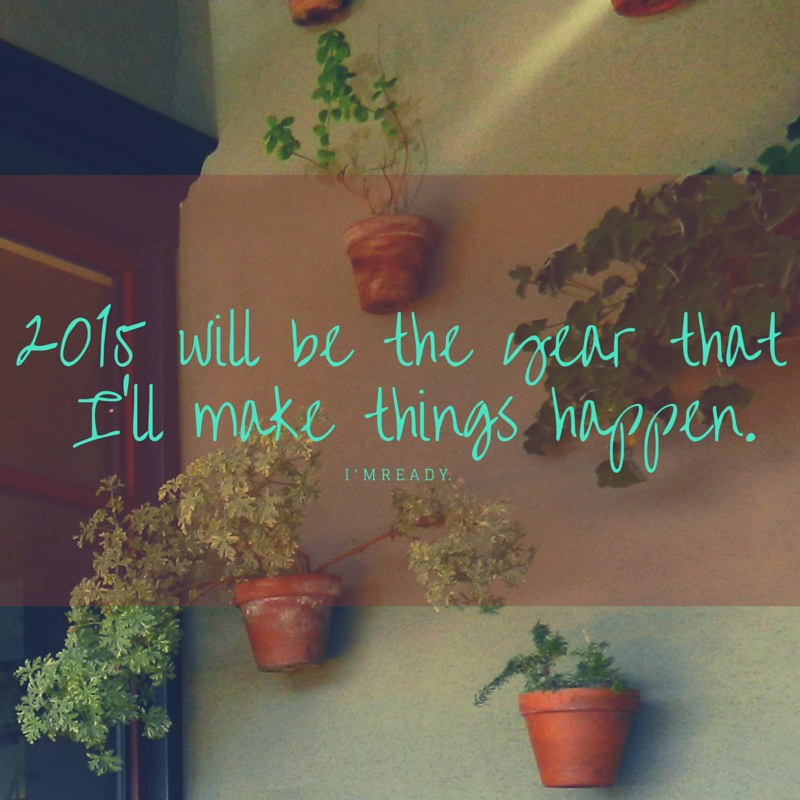 2015 is going to be amazing! So many goals! You are so ambitious, and that's so awesome. I would really love to attend a blogger event this year. I've never been to one, and there will probably be some traveling involved, but it would definitely be worth it. I would love to have a big blog photoshoot too! I did a small one and got my make-up and hair done, but I'd love to have a stylist and all that jazz. I want to learn to cook more Filipino dishes too. All I know how to make is Chicken Adobo. That's funny that you want to say you want to make everything but lumpia, but I don't know how to make it, and I'd love to learn. I need to get my mom to teach me. Good luck with all of your goals! Following through is another thing to go on my personal goals list, haha. Good luck to you too Harper! Thank you; yes it is! Thanks, Tiffany! I hope that you do get the chance to attend a blogger event this year because they are so much fun! They are great for networking, most definitely. I remember that shoot you did! That looked like so much fun for you & I agree having a stylist would be fun :] & for the Filipino dishes, wow that's great you can make chicken adobo! Haha I feel like the difficulty of that is greater than lumpia so you're ahead of me I feel like. Adobo is an ulam (main meat entree type of dish) and lumpia is more of an appetizer which is why I feel that way haha. But yeah, good luck to you on completing your goals as well! I also have a goal to do more #ootd posts. I've only done one so far, but it's definitely a habit I want to make. Fantastic goals I hope you achieve every one of them, it's going to be a great year for you!